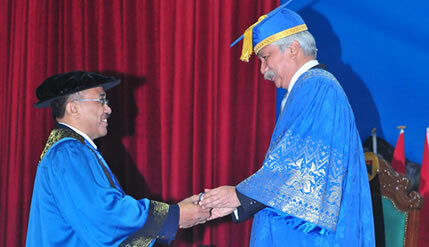 BANGI, 26 Oct 2013 – The Rector of Universitas Padjajaran (UNPAD) of Bandung Indonesia, Prof Dr Ir Ganjar Kurnia has been conferred an honorary PhD (Education Administration) at The National University of Malaysia (UKM) 41st Convocation here today. Prof Ganjar who has been UNPAD’s Rector since 2007 was instrumental in bringing about close cooperation between the two universities in various fields. Among them are the implementation of the Indonesia-Malaysia Cultural Symposium (SKIM) which has continued to be held rotating between them for almost 30 years. Prof Ganjar has strongly supported collaborative partnerships in higher education, in particular conferences, research, exchange of expertise, benchmarking studies, exchange of students and academic programme implementation even before becoming Rector . Responding to the award, the UNPAD Rector thanked UKM and pledged to further enhance UKM-UNPAD joint cooperation. Director of the Centre for Academic Development, Prof Dr Ir Riza Atiq Abdullah OK Rahmat in his citation before the conferment described Prof In Ganjar as an academic who believes in cross-border university education for the good of the community and the strengthening regional ties. Prof Riza said the UNPAD rector has done much to strengthen solidarity between UKM and the Indonesian university to develop academic cooperation and forge close ties between Malaysia and Indonesia. Prof Ganjar was born in Bandung in 1956. He is an academic and cultural scholar of Bandung, West Java and has served as professor of agricultural sociology at UNPAD. He graduated from the Faculty of Social Agricultural Economics, UNPAD in 1979 later obtaining his Masters in 1983 and PhD in 1987 from the University of Paris. Before returning to serve in education, he was a cultural ambassador for Indonesia at the Indonesia Embassy in France. While in France he contributed to the promotion of the Sundanese culture.